Do things ever get lost in the mail for you? I feel like I am constantly having experiences where my mail goes missing. Last week I mailed my mom a copy of the latest Harry Potter book and she's been texting me every day saying it still hasn't arrived. I know the mail can be slow, but come on. Also currently missing is my monthly subway card that I get through work and comes in the mail each month. My card expired today and when I returned home to find my mailbox empty I almost had a freak out. It's just one of those weeks! I temporarily forgot about my mail issues when I met my friend Lisette for lunch today at Mulberry & Vine in Tribeca, near where I work. It's one of those places where you choose three items from the line except that it's much healthier and is technically called "clean eating." It was really good and I had an amazing grilled avocado that was filled with a spicy yogurt mixture, thai chili noodles, and a stone fruit and tomato salad. I'm still not sure where I fall into the clean eating category. I guess I try to eat healthy and don't really indulge in terrible junk food that often, but I still like ice cream, cheese, chocolate, and the occasional hamburger. If I had everything that I wanted in life, I would want to be a clean eater but sometimes I am too tired to whip up an extravagant meal so instead opt for heating up some frozen veggie gyoza from Trader Joe's in the microwave. BUT, going to Mulberry & Vine and seeing all the amazing things there gave me a bit of inspiration, so maybe I will start trying harder. Speaking of clean eating, I'm fairly positive that eating a massive cheese and meat board full of crackers, bread, olives, and cornichons does not qualify. But hey, girls gotta do what a girls gotta do and sometimes (ok most of the time) this is exactly what I'm craving. I did also make homemade hummus to go with this feast and it was amazing. I always forget how easy it is to make your own hummus and how much better it is than store bought! In a blender, whip tahini and ice water. This helps make the hummus extra creamy. Add in chickpeas, olive oil, lemon juice, and spices to the tahini mixture and blend until smooth, stirring if you need to move things around to get the blender moving. If it's too thick add more olive oil. 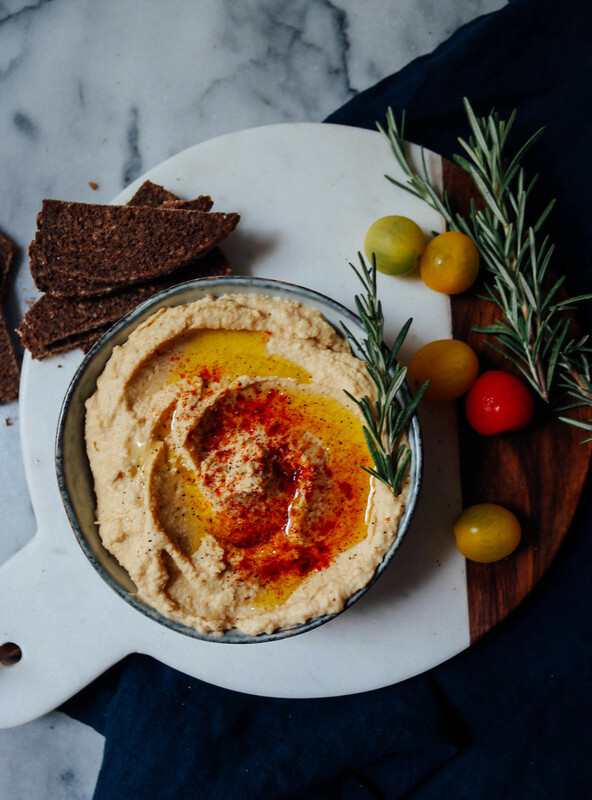 Once well blended, transfer hummus to a bowl and top with olive oil, paprika and a sprig of fresh rosemary. Enjoy with fresh veggies, crackers or bread. Arrange on a cutting board or a plate and go wild!